CODE # 3949-0-#1 Coupon Expires: 4/27/2019. Follow this link for printable coupons good at over 700 locations nationwide. 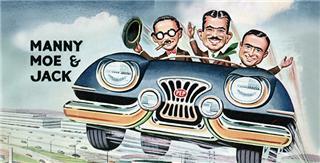 In 1921, four Navy buddies pooled together $800 to open a single auto parts supply store in Philadelphia. This venture would go on to become the multi-billion dollar nationwide retails and service chain that is known as Pep Boys today. With over 700 stores across the U.S. and Puerto Rico, the Company has come a long way from its humble beginnings.